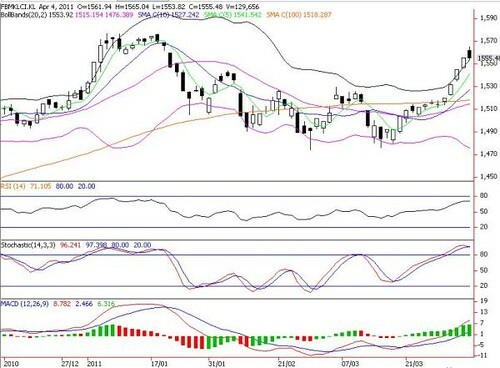 Daily KLCI: More Profit Taking Consolidations As Slow Stochastics Are Overbought. FBM KLCI rose as much as 9.7 points but profit taking trimmed its gains to only 0.1-point at 1555.5 after surging 41 points in four days. Market breadth was positive with 486 gainers against 376 losers while trading volume jumped 12% to 1.69bn shares as investors cheered PM’s assurance that the government will announce a slew of new major and exciting projects over the next few months, as well as its plans to slowly remove subsidy cuts to spur consumption and cap inflation. Last week's breakout rally and positive domestic newsflows have brightened the FBM KLCI outlook in the short to medium term. However, the index should pause for profit-taking given the overbought signals, as well as awaiting clues on the monetary outlook and QE stance ahead of the FOMC minutes today. Immediate resistance levels are 1560-1577 whilst support levels are situated around 1525-1530.